Brachiopods (from the Latin words brachium for arm and poda for foot) are a small phylum of benthic marine invertebrates with an external morphology superficially resembling bivalves, to which they are not closely related. Over 12,000 species are recognized, grouped into over 5,000 genera. Ninety-nine percent of these are known only from the fossil record. At their peak in the Paleozoic the brachiopods were among the most abundant filter-feeders and reef-builders, and occupied a range of ecological niches, including swimming in the style of scallops. However, after the end Permian extinction event, brachiopods recovered only a third of their former diversity and today are only a minor part of the benthic fauna. Each brachiopod animal has two valves made of calcium carbonate or calcium phosphate. The brachial valve carries on its inner surface the brachia ("arms") from which the phylum gets its name, and these support the lophophore, used for filtering food and respiration. The pedicle valve bears the stalk-like cartilaginous foot by which most brachiopods attach themselves to surface. The phylum is split into two major groups based on the form of their hinges. 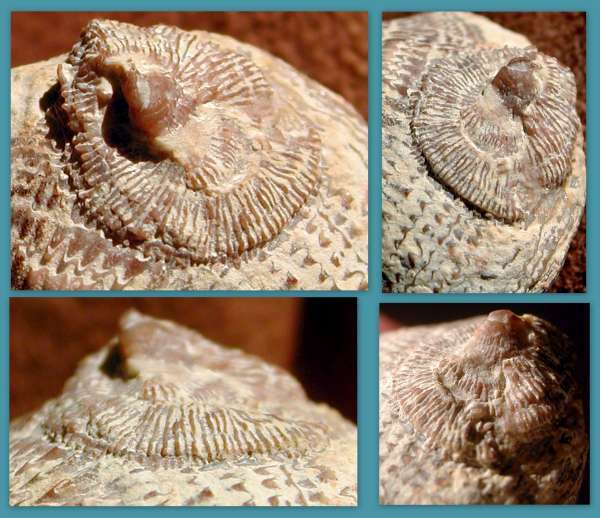 Articulate, or "jointed" brachiopods have teeth which fit into sockets on the brachial valve locking the valves together. Inarticulate brachiopods have no matching teeth and sockets, and their valves are held together only by muscles. Like bryozoans and phoronids, brachiopods have a lophophore, a structure of tentacles whose hair-like cilia create a water current that enables the animal to filter food particles from the water. Unlike bryozoan or phoronid lophophores, which are crowns of tentacles mounted on a single, retractable stalk, the brachiopod lophophore follows the contour of its brachium, an internal scaffold from which the name of the phylum was derived. Lophophores of larger species are folded in complex shapes, loops and coils. Most living species avoid strong currents or waves, and typical sites include rocky overhangs, crevices and caves, the slopes of continental shelves, and in the abyssal depths. However, some articulate species attach to kelp fronds and inhabit some intertidal zones when they can find a sheltered location, such as within the cavities of gravel. 1J. Hall. 1867. Account of some new or little known species of fossils from rocks of the age of the Niagar Group. .State of New York in Senate Document 239:305-410. 2 Dunbar, C. O. 1920. New Species of Devonian Fossils from Western Tennessee. Transactions of The Connecticut Academy of Arts and Sciences, Volume 23, pp 109-158. Connecticut Academy of Arts and Sciences, Yale University, New Haven, CT.
3 A. J. Boucot. 1999. Some Wenlockian-Geddinian, chiefly brachiopod dominated communities of North America. In A. J. Boucot and J. D. Lawson (eds. ), Paleocommunities--a case study from the Silurian and Lower Devonian 549-591. 4 J. V. Neil. 1982. The Early Devonian Fauna of the Mt. Ida Formation in the Heathcote District. Victorian Naturalist 99(5):195-201. 5 N. M. Savage. 1974. 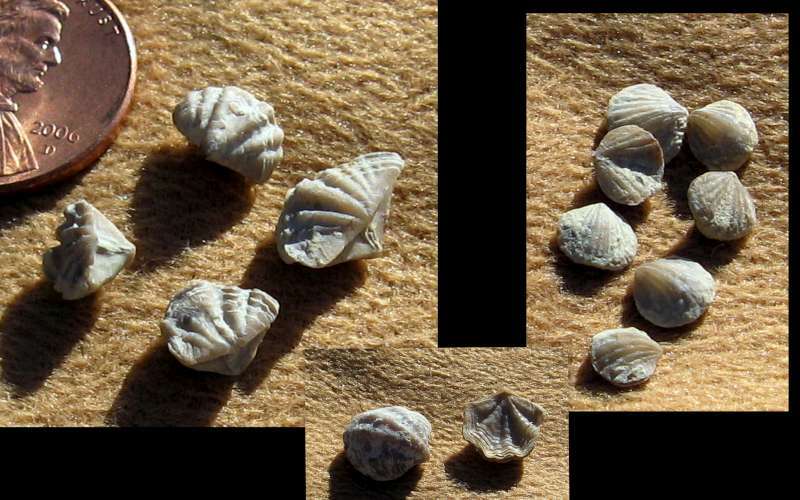 The brachiopods of the Lower Devonian Maradana Shale, New South Wales. Palaeontographica Abteilung A 146(1-3):1-51. Gratitude is extended to Bill Rushlau for finding and preparing the specimen and for providing the photographs of Gypidula multicostata shown in the collage above. 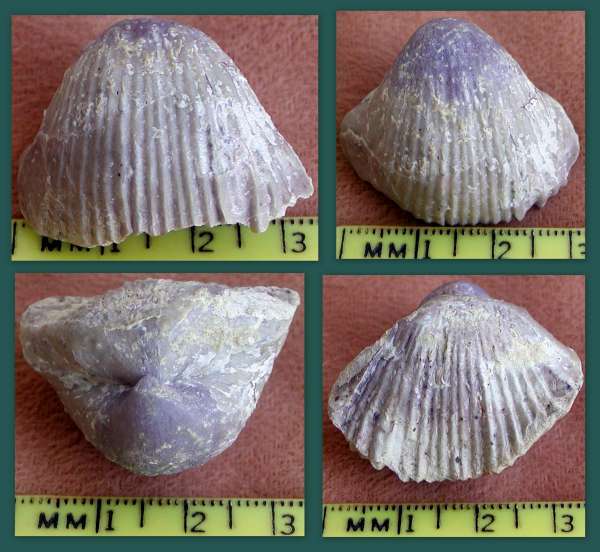 Bill Rushlau recently found a specimen of this inarticulate brachiopod from the genus Philhedra and provided the photographs in the collage below. Since it is only about 12 millimeters in diameter, this may be the first reported occurrence of the genus from the Lochkovian of Oklahoma. Fay and Graffham1 listed a Philhedra species from the Middle Ordovician, Blackriveran Mountain Lake Member of the Bromide Formation south of Ardmore, Oklahoma. From Devonian rocks, Wiedman2 reported Philhedra stewarti and Philhedra crenistriata from the Givetian Silica Shale Member of the Traverse Formation near Woodburn and New Haven in Indiana. This lithified mudstone and packstone formation represents an offshore shelf environment. Kesling and Chilman3 reported Philhedra crenistriatula from the Givetian Silica Formation near Sylvania, Ohio. This well-known formation is a marine deposit of gray-blue calcareous shale and clay-filled limestone. According to the website Paleos: Adult individuals of this order cemented the exteriors of their pedicle valves to a "foreign surface, generally another shell. Commonly, the host is a brachiopod, but it may be a coral, bryozoan colony, crinoid stem, or mollusk. Some species seem to choose a particular species of articulate brachiopod as host. They attached to its host shell when the latter was still alive, but it is never found extending onto adjoined valves, as it might if the crainacean grew on an empty shell." Hoare and Steller4 described how Philhedra crenistriatula tended to prefer attachment to larger brachiopods, particularly Paraspirifer bownockeri. Furthermore, according to Paleos: "A few members of this group (Petrocrania) have the peculiarity of reflecting rather perfectly in the markings of their brachial valve the surface of the host shell to which the craniacean is attached. This may have served the purpose of camouflage, making the animal more inconspicuous." 1 R. O. Fay and A. A. Graffham. 1982. Biostratigraphic and paleontological studies. Echinoderm faunas from the Bromide Formation (Middle Ordovician) of Oklahoma: Lawrence, Kansas, University of Kansas Paleontological Institute Monograph 11 30-33. 2 L. A. Wiedman. 1985. Community paleoecological study of the Silica Shale equivalent of northeastern Indiana. Journal of Paleontology 59(1):160-182. 3 R. V. Kesling and R. B. Chilman. 1975. Strata and megafossils of the Middle Devonian Silica Formation. University of Michigan Papers on Paleontology 8:1-408. 4 R.D. Hoare and D.L. Steller. 1967. 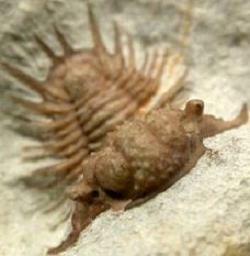 A Devonian Brachiopod with Epifauna. The Ohio Journal of Science 67(5): 291.